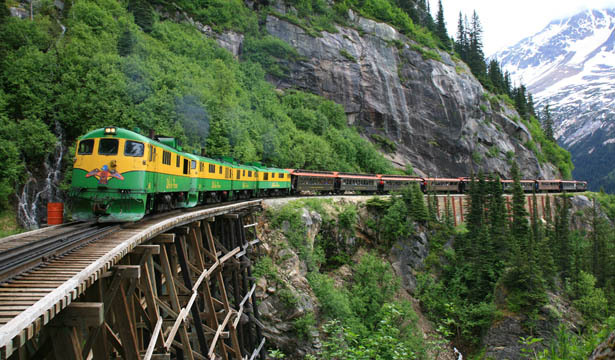 Immerse yourself in the unspoiled beauty of the Yukon, and enjoy the 1898 sights and sounds of the White Pass Railroad, followed by a bicycle adventure along the Klondike Highway returning to Skagway. If you're the type of person that doesn't like missing any of the highlights on your vacation, and you like to be active, then this is undoubtedly the tour for you. Start your tour on the famous White Pass and Yukon Route Railroad, as you soak in Klondike Gold Rush history while immersing yourself in the wondrous landscape of this primal region. Your bicycle ride will include stops to see these sights up close and take advantage of endless photo opportunities. Must be 4'6" tall Minimum age is 13. Professional, local guides fully narrate both parts of the tour. Groups can be accommodated, but book early as space is limited. You must be confident on a bicycle with hand brakes coasting downhill at speeds between 15 and 25 MPH (23 - 40 KPH). Passports and other necessary immigration documents are required for US and Canadian border inspection. Helmets are required. Sport shoes and layered clothing are recommended. Helmet, rain/wind jacket, pant, and fleece gloves are provided by the company. The bike ride is approximately 15 miles in length. Tour time may vary depending on delays at the US Border crossing.